Whether you are an entrepreneur or investor, trying to identify the risks about the opportunity you are about to invest your time or money in can make a big difference to your success, or at least provide some valuable situational awareness. After spending many years evaluating several hundred startups, not surprisingly, the two biggest risks companies generally face are market risk and technical risk or a combination of both. Some people might argue that execution risk (team) is also relevant, but I view that as part of the risk that is inherent in the level of market or technical risk a company decides to take on. To help identify where an opportunity might lie, I use a simply chart that on the x-axis has the level of market adoption risk, and on the y-axis the level of technical risk or difficulty in delivering a product or service. Each of the quadrants below represents a different type of opportunity with a different set of parameters that are valuable to understand in advance. Where your company or investment opportunity fits on this chart is often related to the typical question of: “What market are you in and what problem are you trying to solve?”. Although it is dangerous to generalize, I have labeled customer or market segments that one might typically find or think of in each of these quadrants. Trying to characterize where your company or investment opportunity might fit is helpful because it will usually bring clarity to three important ingredients in building a successful venture: (1) level of investment required, (2) time frame to build the product and company, and (3) what the GTM (Go-To-Market) strategy should be (see blog post on GTM http://wp.me/p3Sj6q-c ). The quadrants that I believe have the best risk-reward profile are II and IV. It is not to say that value cannot be created in the other quadrants, I just think it is difficult. Quadrants I and III are at opposite ends of the spectrum but both are challenging spaces to be in. Q-I is characterized by low technical risk, and low market adoption risk, which means there are no barriers to entry and there is likely very little differentiation to existing products or services. More than likely you end up being a feature or maybe a product, but difficult to see how you might build a company. That limits the ultimate value than can be created. It is possible that through brilliant marketing you may be able to create some differentiation, but then it becomes a question of how much money do you want to spend to do that in a space where you will be characterized as a “me too” company. Quadrant III on the other hand is in the what I call the “not faint of heart” category. As you can see by some of the labels I have used to characterize this quadrant, companies focused on this space usually face long adoption cycles or are defining new market categories (market risk), are building technology that could disrupt the universe (technical risk) and will requite lots of time, capital, and overwhelming determination. The results can be spectacular by creating new market categories or massive disruption of existing ones. My life as a VC, and I would posit that of a large majority of many other tech VCs, has been spent mostly focused on quadrants II and IV. For Storm Ventures, we actually have created a strong discipline around putting all our efforts, energy and domain expertise into finding and building companies in quadrant II, where we get involved as either the first or early investor in these companies. Quadrant II has some of the characteristics of IV with respect to technical difficulty. Investing or building a company that is solving a difficult technical problem that creates compelling value also creates barrier to entry, and sets the company up to at least having a shot of being a category leader. 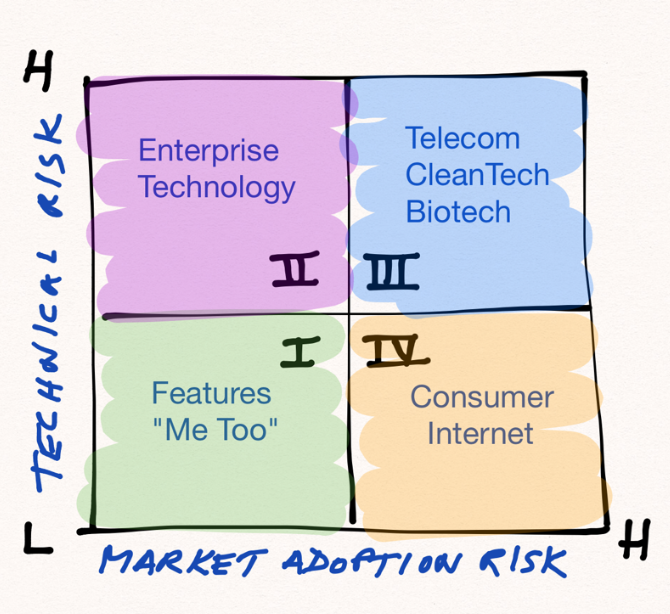 Although by definition there is a willingness to take on technical difficulty and risk in delivering a compelling product or solution, the flip side is that a lot effort has to go into understanding and reducing market adoption risk (for fear of ending up in the quadrant III). This requires that a great deal of time be spent up front vetting the market and talking to as many customers as possible (a dozen or two is a good rule of thumb) about the value proposition you are trying to deliver. The more time you spend doing this, the better. Make sure your questions are truly probing about the value your product or solution will bring to these customers, and also what they are willing to pay. If you do this well, you will have reduced your market adoption risk, and it will set you up to successfully scale your business once you bring your product or service to market. In the case of Storm Ventures, companies like Airespace, Marketo, Sandforce, and Mobile Iron are ones where the entrepreneurs spent large amounts of time in front of dozens of CxOs to validate their products and value proposition. Companies in this quadrant will also require a decent amount of capital (less than in III though) and time-to-market timeframes will also be shorter. Finally, quadrant IV falls into what I am calling the Consumer Internet category, which is fairly broad. There have been very many successful investments and companies in this space, most recent and notable ones include Instagram, Snapchat, Twitter and WhatsApp. Again, I am cautious about generalizing, but typically the technical challenges or difficulty do not create significant barriers to entry, but rather high velocity market adoption is what sets companies apart. The difficulty however is that trying to mitigate market adoption risk is almost impossible (which is why it is high). The only way is to wade in to the market, be brutally focused on user metrics and rapid A/B testing, all while spending as little capital as possible until things go geometric. The key ingredients then become frictionless and compelling value, engagement and retention. And then eventually monetization (or not). Capital required is usually less than II, III or IV and time frames are shorter, and time to fail is faster also. Execution becomes a core part of the investment theme as well as the GTM. Each quadrant has its pros and cons, challenges and opportunities. Salesforce (quadrant II) is 10 years old and is worth $37B as of today. WhatsApp (quadrant IV) is 5 years old and was acquired recently for $19B. My point is that understanding where you fit, before you go on your company building or investment journey, will help set expectations of the things that lie ahead and give you the situational awareness that may make a difference in your ultimate outcome.